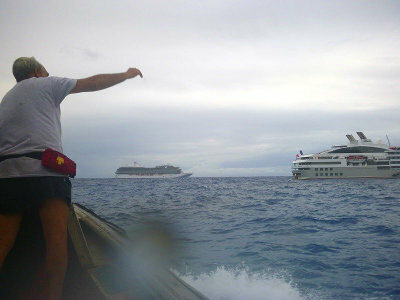 Two cruise ships arrive on the same morning! To become a subscriber to The Pitcairn Miscellany Online, please click here. The Miscellany is full of island news, stories of trips to Oeno and Henderson Island, ship arrivals, local gossip, birthdays, articles written by visitors, events and activities that have happened during each particular month. This publication provides its world-wide readers with a glimpse of life on Pitcairn. Now, you can subscribe to Miscellany and read the latest issue right here on the web. The web site is updated every month with the latest issue, and an annual subscription costs just US$20.00. Hardcopy Miscellany subscriptions are also available. Colour copies of Miscellany are posted from Pitcairn every three months. Just $40 USD per annum including postage and handling! To apply, please click here. Note: Please don't post cheques to Pitcairn Island - the post takes too long. email miscellany@pitcairn.pn Questions about your subscription?